We have a new addition to the family but more of her another day. Suffice it to say she needed some lady dog surgery and has had to wear a buster collar/collar of shame/cornet/lampshade whatever you want to call it, to stop her pulling her stitches out. She is only a year old and full of energy so, after the first day and a half when she was effectively a zombie dog while the anaesthetic wore off , she has been driving me to distraction. She has no apparent sense of having anything round her head so I have been poked and prodded in the legs by a cone of hard plastic, the paintwork on the walls is scuffed, she has scooped up mud (and worse) from the garden on the edge of her cone and smeared it on my rugs, terrified the cats and captured the other dogs’ butts in the cone’s diameter all the better for a hello sniff. On the plus side, it reminded me of something I wanted to do. 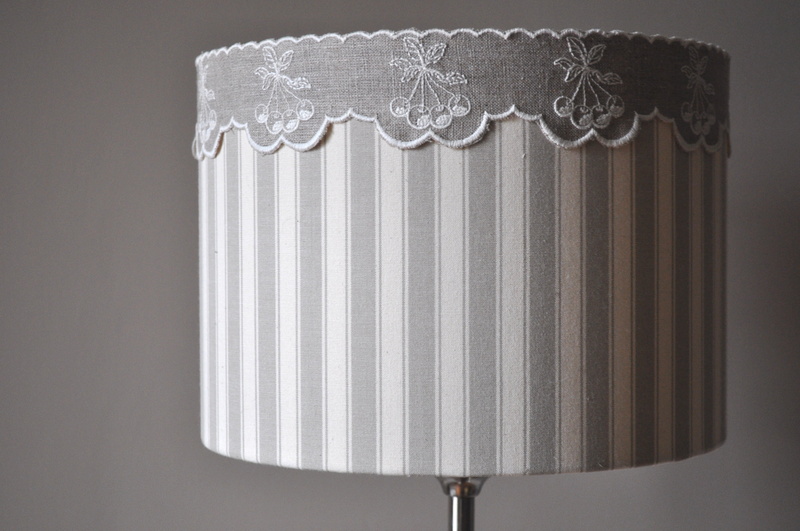 We have had a standard lamp from Ikea for a while now which had a pleated, coolie shaped shade. I hated it because those pleats collect dust like nobody’s business and anything that makes housework is not welcome – I only allow Mr. T, the Madamoiselles and the furred family in the house under sufferance. Mr. T. hated it for reasons he couldn’t actually articulate – I think it was just a man thing. Anyway, a new lampshade was needed so I decided to make one yesterday. I bought a kit. I dug through my fabric stash and, because I was not alone in the house, and therefore not able to give vent to more eccentric choices, ended up with a smart, if conservative, linen and cream striped drum shade. Very nice and very ‘study’ like – which is where it is for – but I couldn’t help thinking it lacked a little something. So, this morning, I got out some of my typical French, traditional shelf edging and found some in linen with embroidered cherries. I think it adds the finishing touch but, as Mr. T. had already left for work, it remains to be seen if he’ll agree. 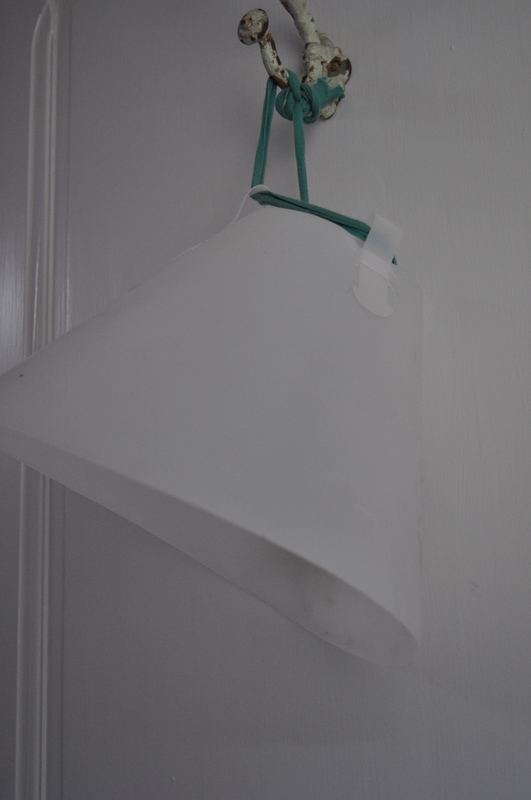 When the lamp is switched on, you can’t actually see the design on the trim, just the shape of it, which looks good but I won’t bore you with another lampshade photograph for now – well, I’m bound to make another one now I’ve had a success! I might even edge a few shelves with the remainder of the trim or I might add it to the others I have in my shop. Just noticed this post is looking far too beige so, to brighten it up, here’s a little preview of the new addition. I know I said I had the dressmaking bug again but I confess I got distracted by another pastime last week. My neighbour is doing up her house and bought some chalk paint and it inspired me to do a bit of painting, distressing and general messing about of my own. 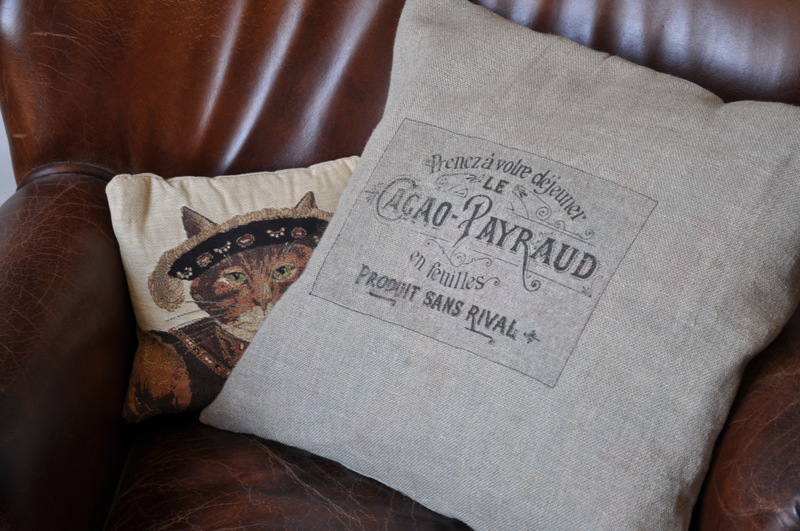 No chalk paint involved here but I was experimenting with transferring graphics and I printed this onto some 100% French linen. I was using TAP (or transfer artist paper) which was recommended on The Graphics Fairy blog (thanks to her for some of these graphics) but I think, because of the darkish colour of the linen, the transfer edges didn’t go completely transparent so I stitched around the outline to make it look as if it were meant to be there all along. Then I made a cushion out of it – as you do. 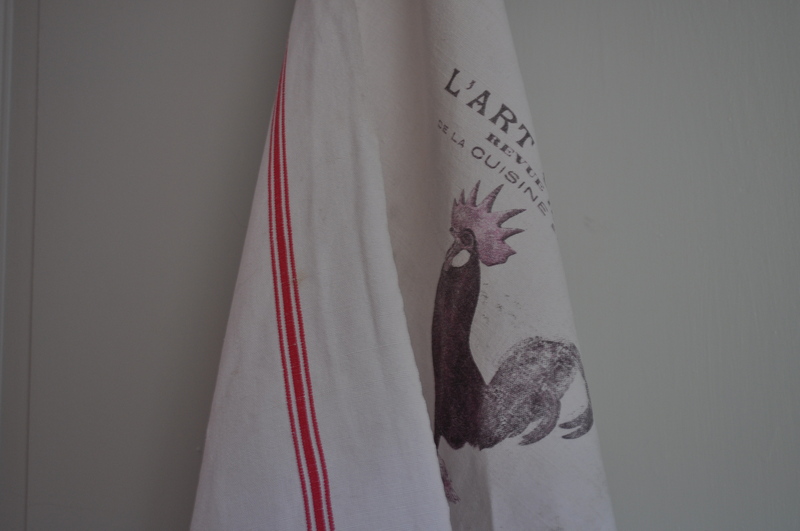 Flushed with success, I put a graphic on one of my vintage French tea towels. 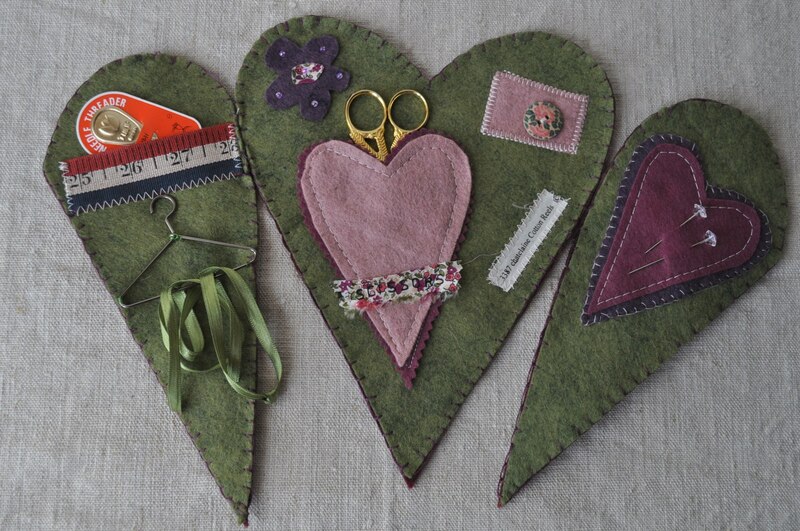 I can’t decide whether to do some of these to put in my handmade shop or whether people prefer them plain as they are in my vintage shop. I think maybe I’ll just do a couple and see how they go. I paid 50 cents for this block of wood with a hole drilled through it in the local charity shop – believe me, you are not as surprised as the bloke who works there who probably thought I’d picked it up off the floor somewhere – just for the purpose of testing the claim that you can use the paper to transfer onto wood. The wood is very rough so the image looks distressed which is sort of the look I was going for. 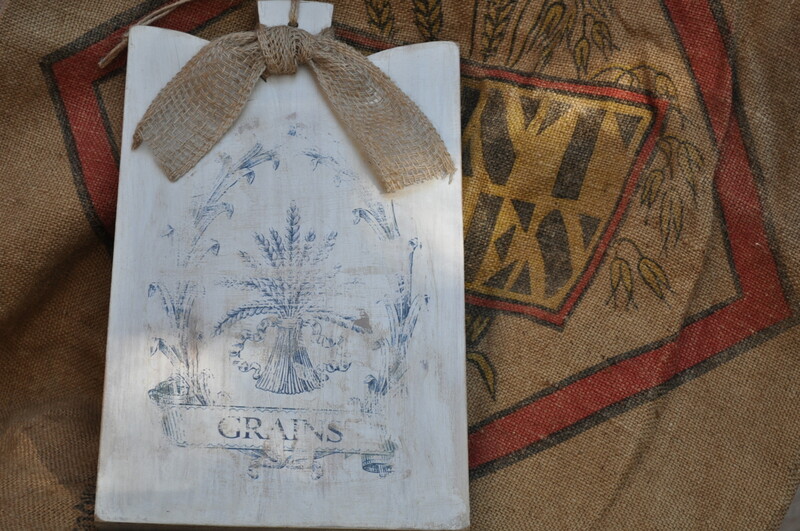 Then I tried it on a plain bread board which had a much smoother grain and I did it over a layer of chalk paint and then distressed it. Again, some of the transfer didn’t come off completely but it is supposed to look aged so it worked for this project. 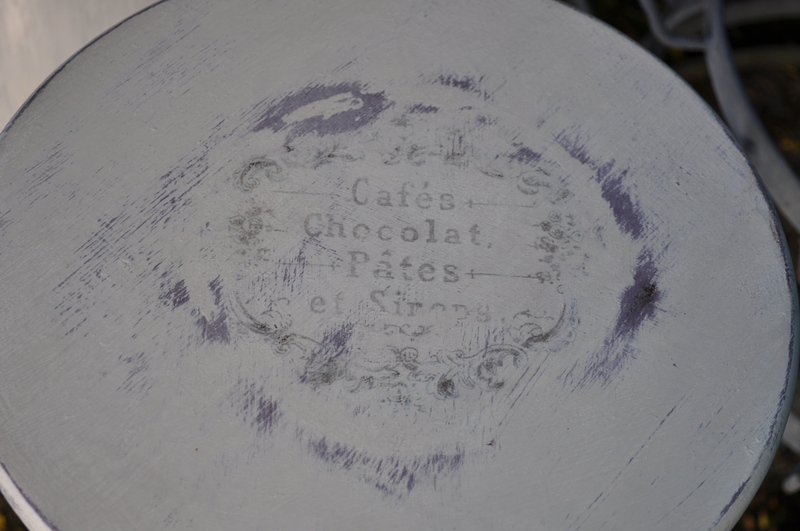 I wanted to try out paint and graphics on a piece of furniture so I picked up this little table for 4 euros in the same charity shop and set to work to transform it. 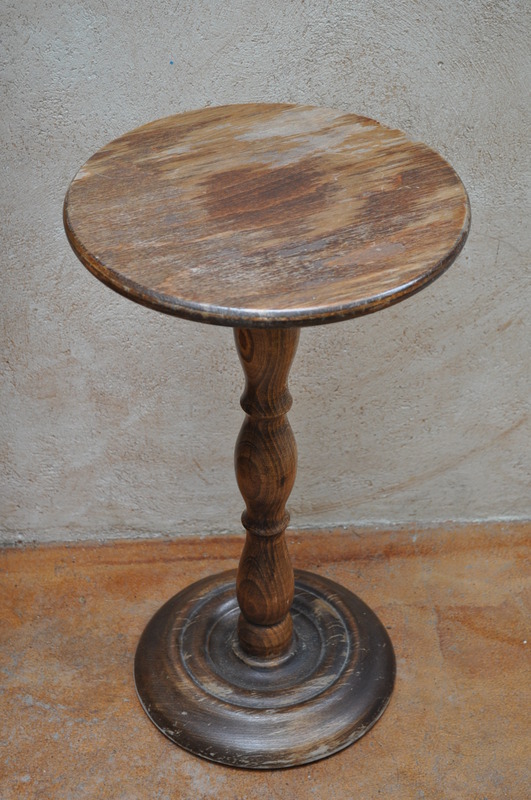 I think it had been cobbled together from parts because the central twisted stem was quite lovely smooth wood whereas the base and top were not such good quality and rougher. 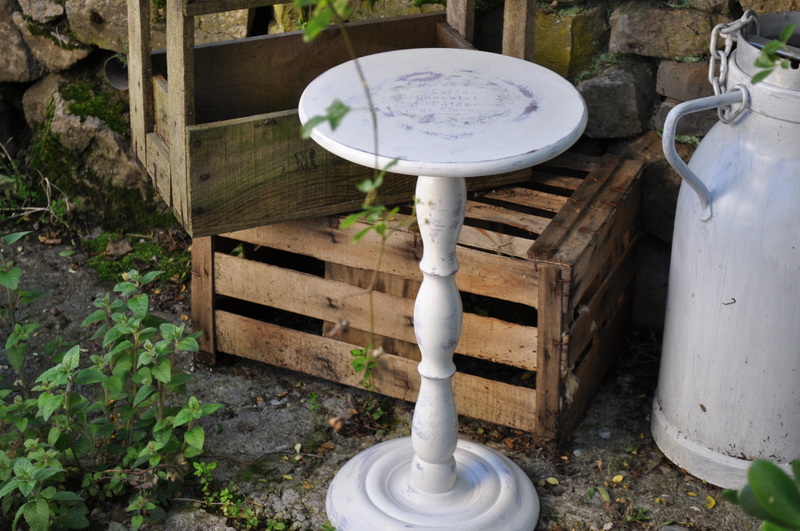 The good thing about the Annie Sloan chalk paint is the fact that you don’t have to do any preparation before using the paint – apart from making sure the item is clean and free of loose bits – which is music to my ears as the preparation is the boring and hard bit. I wondered if it really were true and had my doubts about the smooth wood as there would be no ‘key’ for the paint to hold on to. However, it did paint over very well. 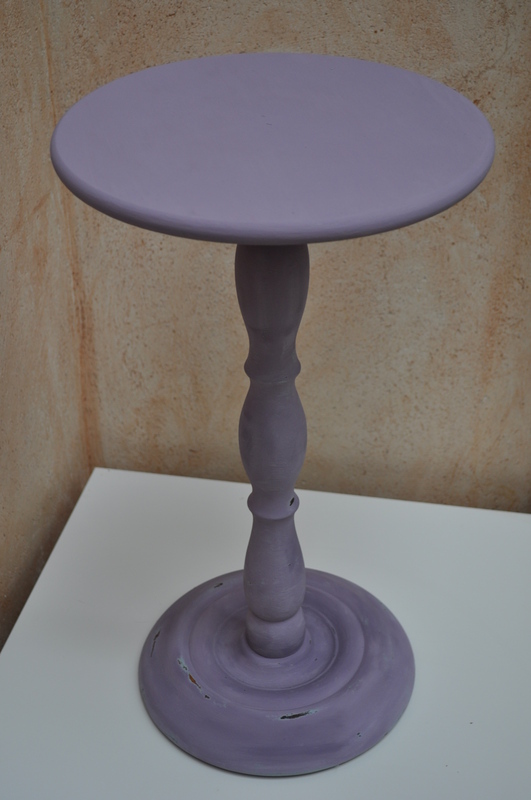 Below is the table with two coats, the first being ‘Duck Egg Blue’, the second ‘Emile’. I did start to distress it a bit but Mr. T. was very distressed himself about the purple colour so I went over it all with ‘Old White’ and then gave it another bit of stress. I put a graphic in the centre – well, I say centre but I was actually about 2cm too much to the right. So, a lesson learnt for next time. I didn’t use transfer paper on this but another method where you cover your paper or cardstock with a layer of ‘school’ glue which is washable, print your image onto it then put a layer of modge podge (I used Decopatch glue as I am in France) on the wood and press the image down. After leaving it to dry overnight, you wet the paper and then start to peel or rub it off and voila! I think this is a good method for anything where it doesn’t matter if the item has a distressed look but I’m not sure I would trust it (or me) enough to do it this way on anything more formal where you want a crisp, sharp image. 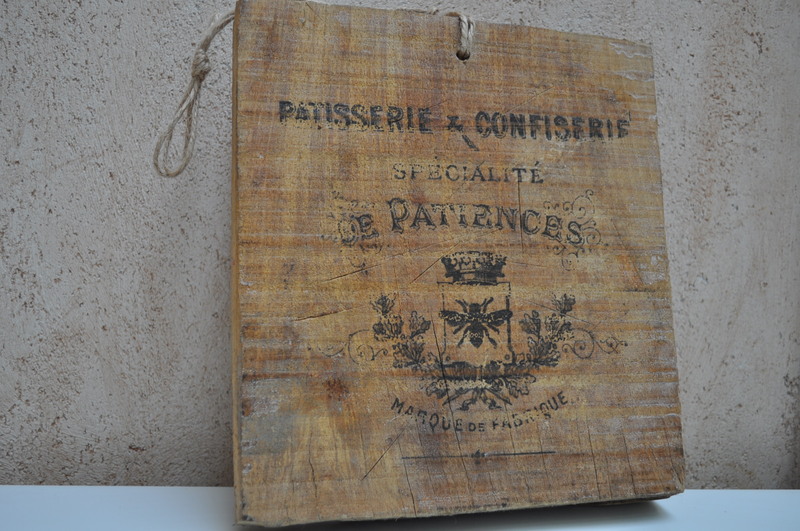 This is a little sleeve board I found whilst on one of my foraging trips. I love the ornate wooden base. I might actually leave the original linen on the top but make a loose cover and use it in my workroom. Don’t worry, I’m not going to chalk paint it even though there are quite a few things around the house I do have my eye on. 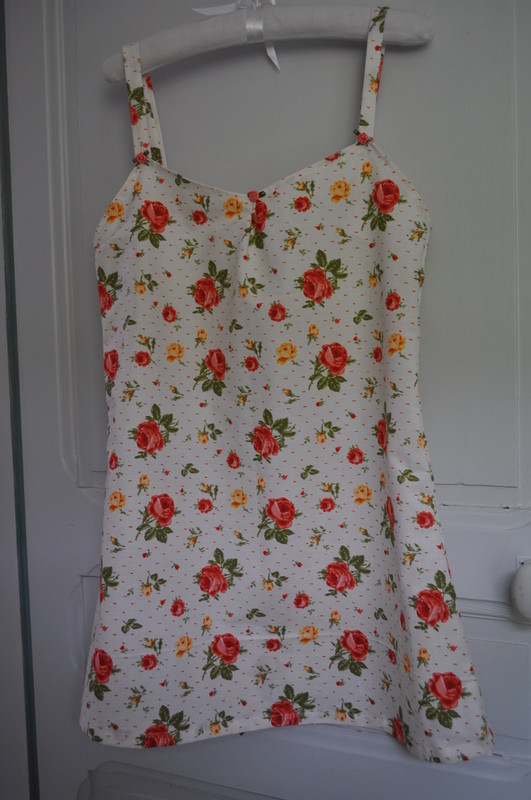 And just to show I haven’t completely abandoned my sewing machine, I was in my workroom the other day and suddenly had the urge to make a nightdress – it just came to me. I drew round one of my old nighties and made a new one. This is the toile really but I might be able to wear it. I have learnt that I need to use a ‘drapier’ cotton or cut it on the bias next time but, apart from that, I was quite pleased. Haven’t washed it yet, hence the fold line near the bottom but you get the idea. On a final note which, as so often in my blog, has nothing to do with the rest of the post, my 3 new chickens, Milly, Molly and Isis(! ), have started to lay, bless ’em. I hadn’t even bothered checking the nesting boxes yet as I thought they were still a bit young but, when I did, there they were. 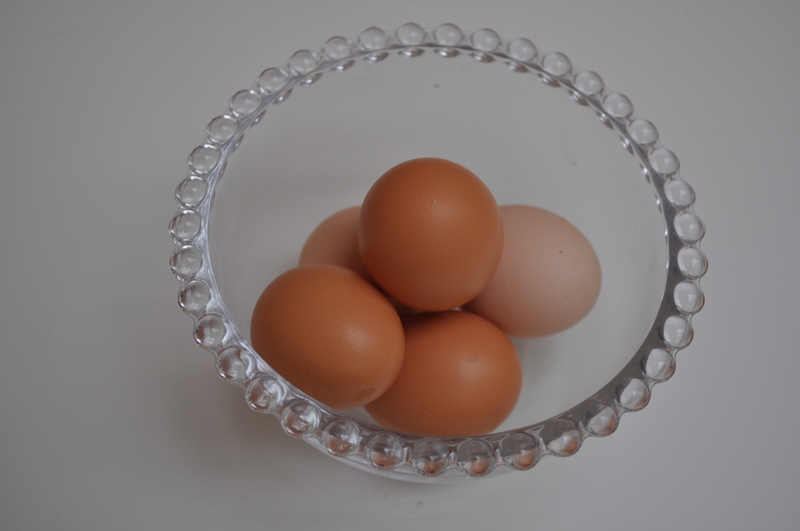 Of course, they didn’t lay them directly into my Nigella Lawson style beaded bowl – they are not that obliging – but I thought it made a better picture than the inside of a nesting box. See how thoughtful I am. 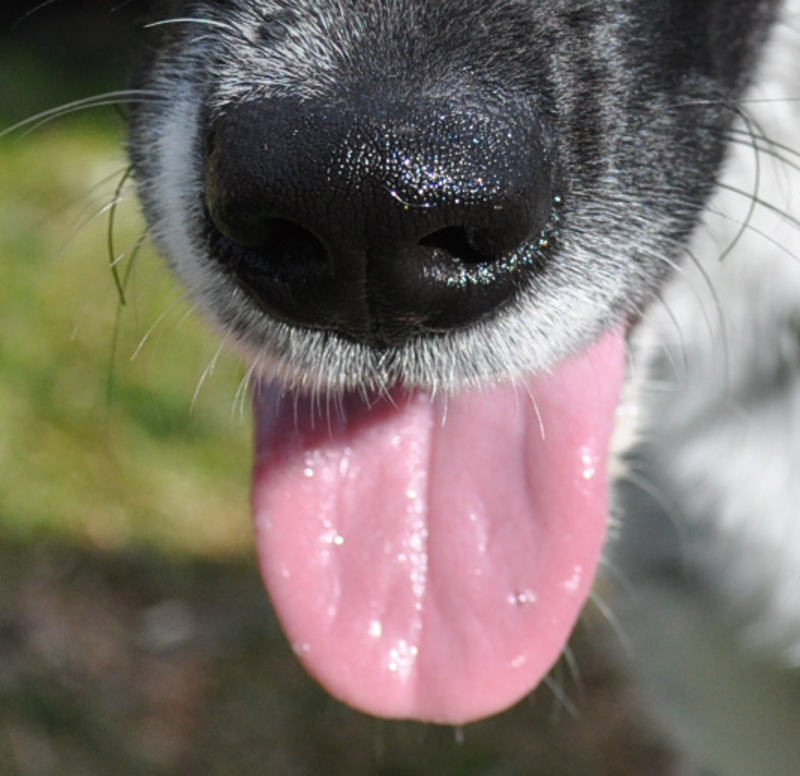 I’m feeling a bit ‘laissez faire’ about my blog at the moment but it will pass I’m sure. It doesn’t help that, now that the clocks have gone back, the light for photography is a bit pants for most of the day so I haven’t been able to take photos of certain things that I would usually have blogged about. I have been busy though, making things for the festive season so I’ll show you some of those, even though I had to take those in bad light too! I’ve got a thing at the moment about using linens, fabrics and trims which I have come across whilst stocking up my vintage shop. 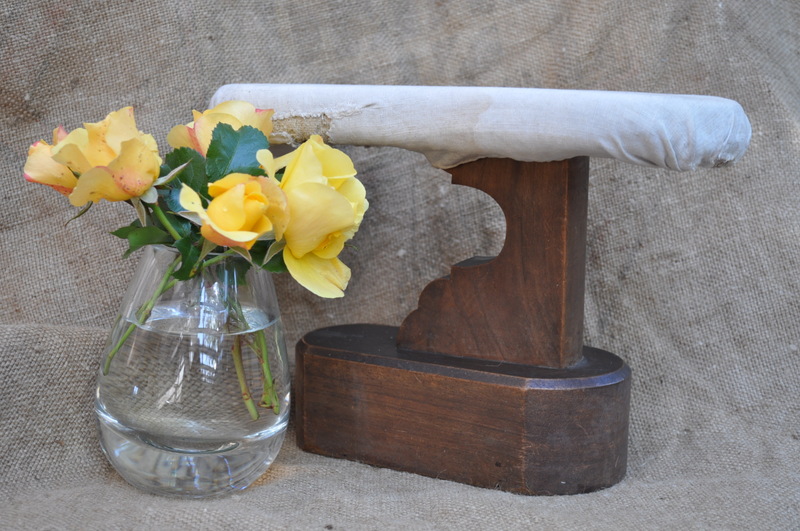 I like making new things out of old things – or ‘upcycling’ as I think the proper term is – and some of these old linens deserve another life instead of being put in the bin. 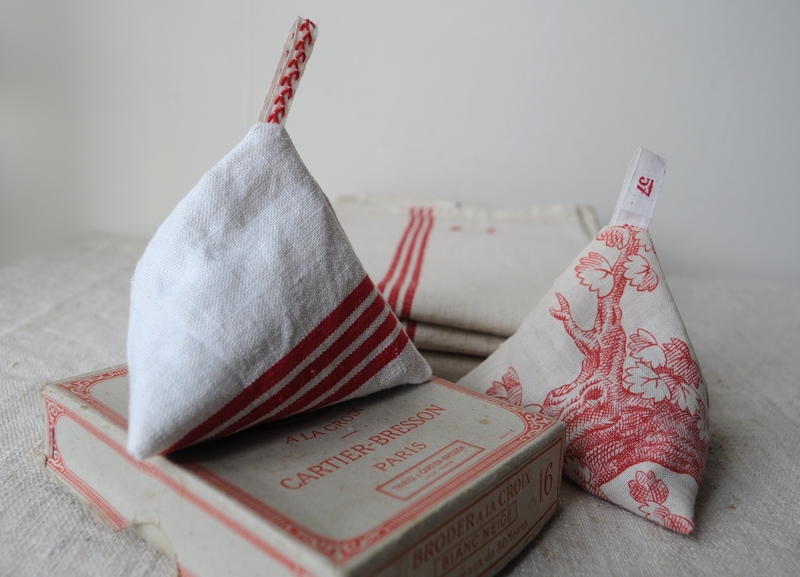 Lavender filled berlingots (or humbugs) made from vintage & antique French linens. 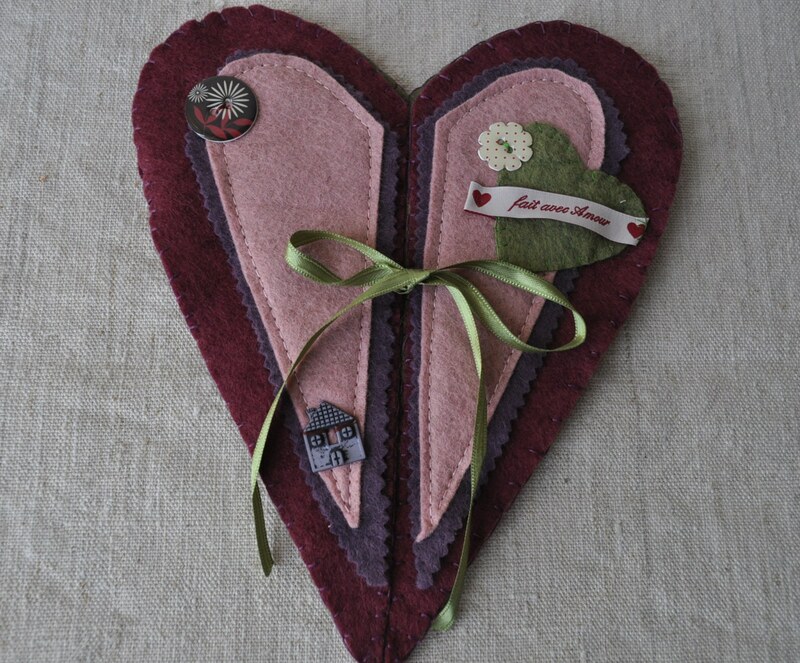 A piece of vintage lace, ‘hooped up’ and decoupaged with words from antique French dictionary. You may remember my musings on what to do with my little 4″ embroidery hoops and also with my stash of gorgeous vintage French linen cloths. Well, here are a few of the results and I’m still thinking………. I had to make some of my whimsical owls using these. This one is English – he says ‘hoot’ but I made the first one saying ‘hou hou’ which is, apparently, what owls say in French. Loving these vintage typewriter keys which my friend Ann (aka Mentalembellisher) sent me and I think make really cool eyes. Somewhere to keep your French bread perhaps.